Compass Rifle .300 Win Mag 24"
Introducing the Thompson Center Compass - A great choice of rifles that can match any budget. Building on a heritage of accurate, affordable firearms - from a trusted American brand. Designed to deliver today's sport shooters and hunters with a feature-rich bolt-action rifle at an affordable price point, the T/C Compass elegantly blends American-made craftsmanship and value into a professional-grade rifle. Adjustable Trigger: User-adjustable between 3.5 and 5 lbs weight of pull and minimum over-travel. 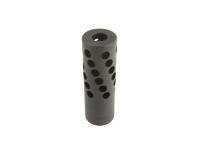 Threaded Muzzle: Threaded muzzle for use with compatible compensators, muzzle brakes and suppressors. 1/2-28 UNEF for 204, 223 & 22-250 | 5/8-24 UNEF for 243 and larger. 3-Lug Bolt Design: Simple, rugged design lends itself to years of reliable service and top-notch accuracy and relibility. 3 Position Safety: Provides visible and tactile feedback as to position of the safety. Provides locked, load/unload and fire positions. Maximun Scope Clearance: The 60 degree bolt lift provided by the 3-lug bolt design gives the shooter maximum clearance between the bolt handle and a mounted scope - for fast cycling. Flush Fit Rotary Magazine: The detachable, compact rotary magazine fits flush with the stock for easy carrying and no snags. The low-maintenance polymer magazine provides smooth feeding in a rust-proof, durable package. 5-rnd capacity in standard calibers and 4-rnds in magnum calibers. Trigger: Adj. 3.5 - 5 lbs.
" Great price and Customer Service. I could not find this rifle anywhere for this low of a price. I also got a rebate too and free shipping! I called them too, three days later and they checked and reassured me it was on the way. I know that was to soon to check but I was excited. Two days later it was here and I live in Georgia. Thank you very much for everything. I wish I could remember the guys name I talked to because he did a great job! Thanks again! God bless and Semper Fi Michael Lane "